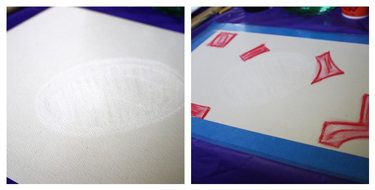 Tape a sheet of sturdy watercolor paper down onto your mess friendly work surface. (we like to use painters tape) Make sure to tape all around each side of your paper. This will hold the paper in place and create a pretty matte effect once it is removed. 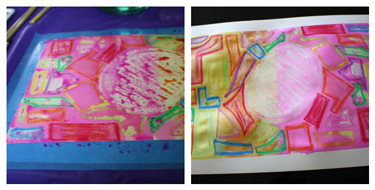 Draw an egg shape onto your paper using a white crayon or oil pastel. Color it in with the white crayon or pastel. 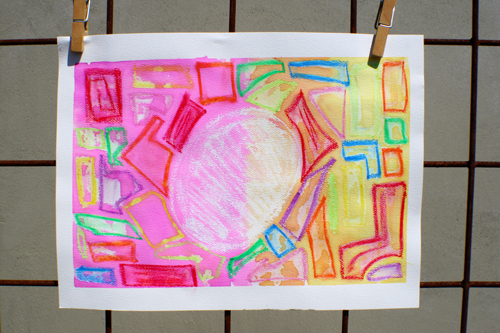 Pick a colored crayon and add a few shapes surrounding your egg shape. Continue adding shapes with other colored crayons or pastels. 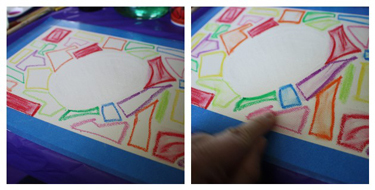 If using pastels, use your fingertip to smudge the color into the shapes. Good quality crayons will smudge as well, though not as much. 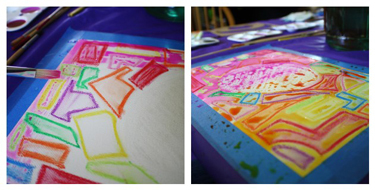 Select a vibrant watercolor color and paint on top of your picture in a large band. Rinse brush and select another color to continue across your page. This picture used two colors. Continue filling your white space with watercolor. Once dry, carefully remove the blue painters tape. Hang in a happy place and admire!